You wake up in the middle of the night drenched from head to toe in sweat. Your pajamas are soaked, and your sheets feel like they just came out of the washing machine. Has this ever happened to you? If so, then you’ve had night sweats. There are a number of reasons why you might be suffering from excessive sweating at night. It’s probably not what you think. They’re not brought on because you wore too many layers to bed or piled on too many blankets. They’re not because you have the thermostat turned up too high or slept too close to that romantic fire in the fireplace. Yes, these things can make you sweat during sleep and soak your sheets, but they’re not considered true night sweats. True night sweats are repeated episodes of excessive sweating that make you feel like a mop in need of wringing out. They’re due to an underlying medical condition or disease. When the conditions that cause the nighttime profuse sweating are treated or overcome, the night sweats and hot flashes stop. Let’s examine the most common causes of night sweats in men and women. The time in life when women begin to transition into middle age is called perimenopause (means “around menopause”) or menopause transition. This is when a woman’s ovaries begin producing less estrogen. It normally happens to women over 40 but can occur earlier. Perimenopause lasts up until menopause, when a woman’s ovaries stop releasing eggs and they stop having menstrual cycles. Night sweats and hot flashes are among the most common symptoms. Other symptoms include nausea, weight gain, and tenderness of the breasts. Once a woman moves from perimenopause to full-blown menopause, the symptoms can increase in number and severity. The average age for the onset of menopause in the United States is 51. Night sweats are a common occurrence in menopausal women. This happens because of hormonal changes affecting estrogen and progesterone levels. These hormones affect the body’s temperature control system. When they’re out-of-whack, like during menopause, get ready for the night sweats. The only sure-fire cure is to grow a little older and move out of the menopausal stage of life. Not very comforting, but in this case, time is a highly effective cure. Hypoglycemia, or low blood sugar, is a common condition among people with diabetes (both type 1 and type 2). It happens when the level of sugar in the blood drops too low to maintain normal body functioning. This is thought to be 70 milligrams or lower per deciliter. Nocturnal hypoglycemia is when blood sugar levels fall to dangerous levels during sleep. Most common in diabetes sufferers, it can happen when too little food is eaten after the nighttime dose of insulin or if too much insulin is taken before sleeping. While less common, hypoglycemia can also happen in people who don’t have diabetes. Non-diabetic hypoglycemia can occur if your body is unable to stabilize blood sugar levels or if your body produces a little too much insulin after a meal. Night sweating is also a symptom of non-diabetic hypoglycemia. The treatments for hypoglycemia depend upon the cause. The initial approach for any type of hypoglycemia is eating a fast-acting carbohydrate, sugary food or fruit juice. Foods containing fat or protein are not good choices because they affect the way the body absorbs sugar. Diabetics regulate glucose levels through doses of insulin and frequent checking of glucose levels. If you’re not diabetic, there may be another underlying cause for your hypoglycemia. Visit with your primary care physician for help in diagnosing another illness that may be responsible for causing hypoglycemic night sweats. Hormonal disorders or imbalances occur whenever there is an overabundance or deficiency of a hormone in the bloodstream. Because of the power of hormones and the essential roles they play in the proper functioning of our bodies, even a small imbalance can cause unpleasant or even dangerous symptoms. A common symptom is night sweats. Hormones are chemical compounds produced by glands in our endocrine systems. They move throughout the body via the blood to deliver messages and instructions to our organs. They regulate many of the body’s vital functions. These include insulin, steroids, growth hormones, adrenaline, and many more. Everybody will experience hormonal imbalances. Men and women will have them when going through puberty or growth spurts. Women go through menopause. Men experience testosterone level changes. The causes of hormonal imbalances range from medical disorders to obesity and dietary issues. Allergies and physical injury can also cause hormonal problems. Effective treatments are dependent upon the cause. Make an appointment with your primary care physician to get started on diagnosing the cause and best treatment for your hormonal imbalance. Your doctor can offer a hormone therapy tailored to your situation. Night sweats are often caused by hyperhidrosis, a condition characterized by excessive and uncontrollable sweating for no apparent reason. It’s a disorder that affects about 15 million people in the United States. Its cause is not well understood but is thought to be hereditary. While there is no cure, there are a number of effective treatments. In this instance, when excessive sweating happens in the night, it’s not because you’ve stacked on too many blankets or you’re wearing the latest in thermal underwear. It’s not even because you’re having a bad drug side effect or even an imbalance of hormones. It’s because your sweat glands are being triggered into hyperactivity by your nervous system. Sufferers of hyperhidrosis not only experience night sweats, but also profuse sweating during the day. Their lives are profoundly affected by excessive sweating in every situation and setting, even while completely rested and relaxed in sleep. There are dozens of treatments for hyperhidrosis. Some are simple, easy, and inexpensive while others can be invasive, expensive, and painful. One of the best and most frequently used is a prescription strength antiperspirant like SweatBlock. These contain an aluminum chloride ingredient that effectively blocks sweat glands from secreting sweat by forming a gel-like plug. A single application can last up to 7 days. SweatBlock products are proven safe, effective, and life-altering. Infections are a well-known cause of night sweats. The most common infection linked to night sweats is tuberculosis. HIV infections are also frequently accompanied by night sweats. Other infections associated with night sweats are endocarditis (inflammation of the heart valves), osteomyelitis (inflammation of the bones) and abscesses. Night sweats caused by an infection are alleviated by treating the underlying infection. Cancer is one of the other causes of night sweats. Sweating at night is an early symptom of multiple forms of cancer. The most prevalent type of cancer associated with night sweats is lymphoma. Lymphoma is cancer that begins in the lymphocytes, the immune system cells that fight infections. People who have undiagnosed cancer often exhibit other symptoms, like unexplained weight loss and frequent fever. The treatment for night sweats caused by cancer is the treatment of the cancer itself. Night sweats can result from taking antidepressants. Studies have shown that up to 22% of men and women taking antidepressants experience night sweats as a side effect. This kind of sweating is called secondary hyperhidrosis, or excessive sweating caused by a secondary and unrelated medical problem. Two antidepressants, sertraline and venlafaxine, are notably linked to nights sweats. The good news is that if antidepressants are causing night sweats or other negative side effects, they can be managed and even reversed. As reported by the International Hyperhidrosis Society, Dr. Jonathan Scarff found that an anticholinergic medicine called benztropine reduced or eliminated antidepressant sweating. If you take an antidepressant and you’re suffering from night sweats, talk to your doctor about finding a therapy that can help you get a good night’s sleep without sweating. What can you do if a medication you are taking causes excessive sweating at night? Your options include reducing the dose, finding a substitute drug, or discontinuing the medications altogether. Don’t do any of these things without first consulting your doctor. Please note: The above lists are not intended to be all-inclusive. Another rare cause of night sweats in men and women is a neurological disorder. Some of these disorders are dysreflexia, post-traumatic syringomyelia, stroke, and autonomic neuropathy. 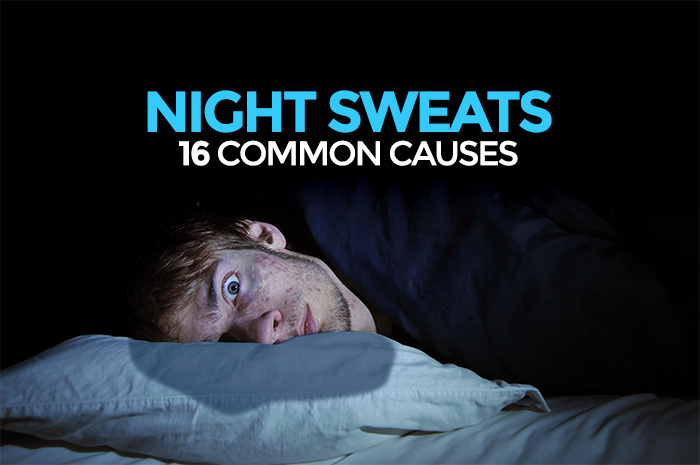 If you’re experiencing night sweats and you’ve been diagnosed with one of these disorders, it’s likely to be the cause. The thyroid gland is two inches long, shaped roughly like a butterfly, and located in the front area of your neck. It produces hormones that control and regulate the body’s metabolic rate, heart, muscles, digestive functions, development of the brain and bone maintenance. The thyroid even helps regulate cholesterol levels. It’s an essential part of the endocrine system. If your thyroid gland produces too much thyroid hormone, the overproduction of the hormone creates a condition known as hyperthyroidism. An estimated 30 million Americans suffer from some form of thyroid disorder. Hyperthyroidism most common occurs most commonly in women over 35. One of the symptoms of hyperthyroidism is excessive sweating, especially at night. An underproduction of thyroid hormones can also cause night sweats. Treatments for hyperthyroidism range from taking radioactive iodine or other antithyroid medicines by mouth to invasive thyroid surgery. Successfully treating the thyroid will stop this cause of night sweats. Here’s some bad news for people, especially women, who drink coffee, tea and/or caffeinated sodas. Caffeinated drinks might be causing those troublesome hot flashes and night sweats. Researchers have discovered a link between caffeine consumption, hot flashes, and night sweats in women. If you’re having hot flashes or night sweats and you’re consuming lots of coffee or tea, you’ll probably want to significantly reduce your caffeine habit. It probably doesn’t matter what temperature your caffeine is, so large servings of Coke, Pepsi or Dr. Pepper (among many others) can have the same effect. Tuberculosis (TB) is a bacterial infection that primarily affects the lungs, though it can affect other organs as well. The infection is spread when a person inhales tiny droplets expelled when an infected person coughs or sneezes. TB can be difficult to diagnose in its early stages, and you could have TB and not know it. An infected person can be afflicted with tuberculosis for weeks before they begin to feel sick or experience symptoms. In addition to the lungs, TB also affects the lymph nodes. A lymph node (lymph gland) is a small gland about the size and shape of a bean. Lymph nodes are an important component of the body’s immune system. They contain lymphocytes (white blood cells) that enable the body to fight disease and infection. They act as filters, trapping bacteria, viruses and other disease-causing substances before they can infect other regions of the body. Lymph nodes are connected to each other by a network of lymph vessels. Lymph nodes are found in groups and concentrations of lymph nodes are located in the neck, underarms, chest, groin and the abdomen area. Symptoms of TB, while sometimes difficult to detect, usually include swollen glands and night sweats. Other common tuberculosis symptoms are fatigue, weight loss, and chronic fever. Tuberculosis can be treated with antibiotics, though particularly virulent and drug-resistant strains require prolonged treatment with a cocktail of several medications. Obstructive sleep apnea occurs when the throat narrows, restricting breathing while sleeping. During sleep, breathing dangerously stops and starts repeatedly. Many people suffer from sleep apnea without knowing it. Loud snoring is one of the main symptoms. Those who suffer from untreated sleep apnea are three times more likely to have night sweats than others. Sleep apnea is treated by wearing a CPAP (Continuous Positive Airway Pressure) device during sleep. The device sends a gentle current of pressurized air into the throat keeping it open. Feeling anxious from time to time is something we all experience. We become especially anxious when faced with a difficult problem, taking an exam, preparing for a job interview or even before a first date. Anxiety disorder is something altogether different. Anxiety disorders are classified as mental illnesses and interfere with everyday living. People with an anxiety disorder live in constant fear, worry and even dread. Just leaving the house can bring on an episode and leave them paralyzed. When your nervous system becomes hyperstimulated because of stress, the body can respond erratically causing dysfunctions like sweating profusely during sleep. Sweating while sleeping is a predominant symptom of anxiety disorders and panic attacks. Night sweats caused by anxiety can occur infrequently or every night. They can come and go with no real pattern, ranging from slight to severe. You could wake up with just a little sweat on your brow or be completely soaked from head to toe. Night sweats due to anxiety will stop when the stress stops. If you think you might be suffering from night sweats due to anxiety disorder, make an appointment with your doctor to explore ways to treat your anxiety. Obesity by itself can lead to night sweats. BMI (Body Mass Index) is a measure of a person’s weight in relationship to height and measures total body fat in adults. A BMI score of 26 to 27 would be considered overweight and can lead to moderate health risks. It’s estimated that 20% of Americans are classified as overweight. A BMI score of 30 or higher is considered obese. Night sweats are a common result of obesity. Body fat acts as insulation and will keep heat in. More heat means more hot flashes and night sweats. In women, obesity can increase the severity of menopause symptoms. The treatment is not complicated nor is it simple. Losing weight will stop hot flashes and night sweats caused by obesity. We’ve explored several causes of night sweats and hot flashes in women, now it’s time to talk about night sweats in men. While women go through menopause, the change in estrogen levels can cause night sweats. Men, on the other hand, don’t normally experience dramatic drops in testosterone, but when low testosterone does occur, it can have a similar impact. Doctors and scientists don’t know why a drop in testosterone levels causes hot flashes and night sweats. There is speculation that the hypothalamus, the region of the brain responsible for regulating body temperature, is the guilty organ. When operating normally, the hypothalamus signals blood vessels to dilate when the body becomes overheated. The increased blood flow causes a man’s face to become flushed. To deal with the elevated temperature, sweat glands are activated. Sweating is, of course, the body’s way of regulating its temperature. Low-T may somehow cause the hypothalamus to “jump the gun” and cause unwelcome and profuse sweating during sleep by triggering the 2 to 4 million sweat glands in your body. Hormone replacement therapy may provide relief but can also increase the chance of prostate cancer. For men who have already been diagnosed with prostate cancer, hormone replacement therapy is not an option. Low-T is not the only condition that can cause night sweats in men. If you’re experiencing night sweats, be sure to see your doctor. Night sweats are not uncommon and affect an estimated 3 percent of the population. Although most cases of night sweating are not caused by life-threatening conditions, you should always talk with a qualified physician to determine the cause. Cancer, tuberculosis and other serious diseases could be the underlying causes. There are effective treatments that can alleviate or significantly reduce night sweats in men and women. These treatments include oral medication, changing your diet, or using a clinical-strength antiperspirant like SweatBlock. Take advantage of the tried and true remedies so that you don’t have to “sweat it” when you go to sleep.